A wise person once told me, “use your power for good”. There is always someone who is less fortunate than you and always someone who could use your help. A new project by eBay is helping celebrities do exactly that. 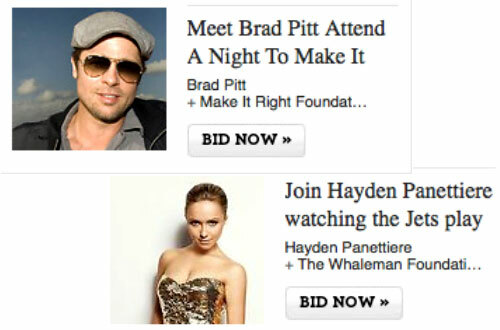 The auction site has long been known for being the place to go to get celebrity paraphernalia. Now, eBay Celebrity is a section on the site to get your favorite pieces from the stars and the proceeds all go to the celebrity’s favorite charity instead of some collectors pocket. Things such as a meet and greet and charity dinner with Brad Pitt or a leather jacket from Sienna Miller can all be found in this charity arena. Instead of bidding on something that you are unsure is authentic, you can be guaranteed that it’s coming straight from your celebrity idol. Other than the obvious benefit to the charities, this also was a great move on eBay’s part to better their business and a great move for the celebrities so that they can control what is being auctioned under their name. A fake on the Internet isn’t as easy to spot as it is in real life. The celebrities can now guarantee that the piece that is representing them is authentic and will satisfy their fans. eBay has seen a huge improvement in searches that include celebrity names. Justin Bieber has seen a 107% increase in searches on eBay. Because eBay is seeing increase in collateral sales, they are not taking any percentage from the celebrity auction house. It’s great to see a win (celebrity), win (eBay), win (fan) come out of such a great project! 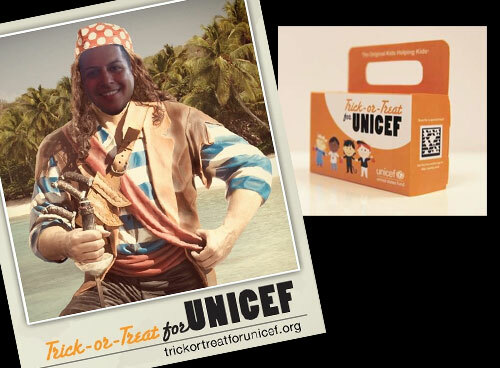 It’s not easy taking something as simple as the UNICEF trick or treat donation box and making it evolve with technology but the people over at the United States Committee for UNICEF have managed to do just that. In 1950, the year of it’s inception, the program raised just $17 when a small group of kids in Philadelphia, PA walked their neighborhood asking for dimes and nickels instead of treats and candy on Halloween. That has grown to the massive participation today which has raised over $144 million for undernourished children. The box has slowly evolved since it’s origins. In the 50′s, it was just an empty milk carton. In 2008 UNICEF introduced mobile phone text messaging, along with donation collections on MySpace and Facebook. Starting this year participants will have to opportunity to scan a QR code which will make the donation experience much more interactive. Not only are you able to donate through this web portal, but you can also upload a picture of yourself and create a digital costume which can be shared over the web. Depending on your donation amount, you are able to select from a number of digital costumes and photo effects. So this year as you are out buying bags of candy for the children of your neighborhood, be sure to also download a QR code reader and do your part to help the less fortunate children in the world.